New-car launches usually take center stage at the Detroit auto show, but this year much of the attention will be focused on the signals carmakers give about their prospects for 2009. In the weeks leading up to the annual event, the so-called Detroit 3 -- General Motors, Ford Motor and Chrysler -- were involved in a battle for their survival. Some automakers such as Nissan, Land Rover and Rolls-Royce pulled out of the show, while others downsized their participation. Despite the gloomy market conditions and reduced marketing budgets, most big players including the European carmakers Volkswagen, BMW, Mercedes-Benz and Audi, still want to be there. Detroit is, after all, the most important show of the year for the worlds biggest car market. Among the key launches in Detroit will be the third-generation Toyota Prius gasoline-electric hybrid and Hondas second-generation Insight hybrid. Audi will unveil a concept previewing the A7 four-door coupe, the latest model in a product offensive that aims to boost the brands sales to 1.5 million by 2015, up from more than a million expected in 2008. BMW will show the new Z4 two-seat premium roadster while BMWs Mini brand will show a convertible version of its hot-selling second-generation entry-premium car. Volkswagen will unwrap a concept for a mid-engine roadster that could become an image booster for the German carmaker, which is building a new plant in the US. Honda will debut the production version of the Insight hybrid, which was shown as a concept at the Paris auto show in October 2008. The 5-door hatchback will be the first of a new family of models that are part of the carmakers strategy to boost hybrid sales to 500,000 units by 2012. The Insight will be followed by a production version of the CR-Z hybrid sports car and a Jazz hybrid. After its launch in the spring, Honda aims to sell 200,000 Insights a year, half in North America and half in the rest of the world. Honda says the Insight will cost less than other hybrids to attract first-time buyers. Mercedes-Benz will preview 3 fuel-saving technologies in a concept for its new entry-premium model range at the show. The Concept BlueZero will be shown as a pure electric car; a plug-in hybrid and as a fuel cell model. 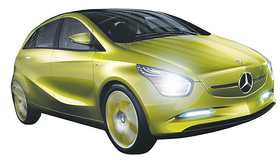 The concept will preview the design for the B-class replacement due in 2010. Called the E-Cell, the electric car will have a 100-kilowatt motor with a lithium-ion battery pack and a 100km range. The plug-in hybrid will have a 3-cylinder gasoline engine with an electric generator to extend the cars range in electric mode, an arrangement similar to what GM plans for the Chevrolet Volt. The third version, called the F-Cell, uses a fuel cell and hydrogen tanks to generate electricity for the electric motors. Mercedes plans to replace and B class and sister model, the A class, with four cars. These will include a coupe to rival the BMW 1 series and an SUV to challenge BMWs upcoming X1. Mercedes will build the B- and A-class replacements in Rastatt, Germany, and in a new 100,000-unit plant due to open in 2011 in Kecskemet, Hungary, 80km from Budapest. BMW will debut the convertible version of its second-generation Mini at the show. Sales of the cabriolet start in March. The car has a new folding softtop roof. Developed by German roof specialist Edscha, the softtop folds behind the rear seats in 15 seconds. It can also partially retract to create the effect of a sunroof. One safety difference between the new and current convertible is the change from fixed rollover hoops to a single rollover bar, which pops up to protect passengers if sensors detect an impending accident in which the car may roll. Toyota is making its new Prius larger than the current model and is adding a new body style to broaden the appeal of the gasoline-electric hybrid car. The third-generation Prius will debut in Detroit as a hatchback. Toyota will add a larger version, which can be used as station wagon or minivan. The Prius is crucial for Toyotas goal of reaching 1 million annual sales of hybrid models in the next decade. The new model keeps the same aerodynamic shape as the current car. It will use an improved nickel-metal hydride battery rather than more expensive lithium-ion batteries. The new Prius will have a wider body to comfortably accommodate three adults in the back seat. This also is a crucial feature for taxi drivers, who are choosing the Prius over Mercedes and other premium models in European cities. The second body style is also intended for being used as a city delivery van. Many companies use Prius cars in Europe to deliver goods in cities. Volvo will add new safety and fuel-saving features to its next S60 sedan, which will debut as a concept in Detroit. When it launches in 2010, the sedan will have sensors that can apply the brakes if a pedestrian steps into the cars path. The medium-premium sedan will be offered with a downsized 180hp 1.6-liter turbocharged gasoline direct-injection engine that has CO2 emissions of 119 grams per kilometer and uses 5.0 liters of fuel per 100km. Another fuel-saving device on the concept that will make it into production is a stop-start system. The concept also has a more dynamic and aggressive design than the current S60, which was launched in 2000 and is Volvos oldest model on the market. Volkswagen will unveil a concept for a mid-engine roadster that previews a two-seater that the carmaker plans to launch in 2011. 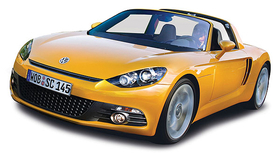 VW plans to add the roadster to give the companys conservative brand image a sporty boost. The new model will be about the size as the Mazda MX-5. The Detroit concept will have a folding softtop. Sources say the new car will have a mid-engine layout with rear-wheel drive. The roadster could be the first car based on a new VW group platform for sports cars, VW group CEO Martin Winterkorn told the German magazine auto motor und sport in an interview published November 20.